If you see a copy of the March/April edition of Sailing World magazine, check out Kurt Hoehne's article "Maximum Challenge" on Craig's Transat experiences. Early in the afternoon (Guadeloupe time), Craig crossed the finish line in Pointe-a-Pitre. His time of 25 days and 10 hours puts him in 10th place among the series boats. Pictures of Craig's finish are on Facebook and on the official race page. After days of light, unpredictable winds, the trade winds have finally filled in again and Craig is back to sailing 8+ knots. With just under 1000 NM to go, 587 Naked Retreats is in 11th place. Only 3 NM separate 10th from 13th place, so it is a close race. Craig passed the half-way mark on November 25 at 11:37 UTC and is now well on his way to the finish line in Guadeloupe. Three of the boats that dove down to the stronger trade winds to south have passed 587, pushing him back to 10th place in the rankings. Staying south seems to still be paying off for them, but over the next few days, the trade winds are predicted to dissolve into unpredictable and patchy light breezes mixed with thunderstorms. Those who can get to the stronger winds in the west the fastest should be in the best position. You can see the current wind conditions on the "Cartographie" by clicking the button with arrowheads on the top right. Once selected, the ï¿½playï¿½ button for the forecast should be visible directly underneath. The answers: he didn't stop. All must be well-enough on board 587 Naked Retreats. And he chose the direct route through the islands. Craig has passed through the Canaries and is turning south to the find the trade winds. He is currently in 9th place, but we will have to wait to see what happens in the rankings when he converges with the boats that chose to turn south sooner. Craig is approaching the gate at Puerto Calero in the Canary Islands. Currently in 11th place, he now has some decisions to make. Firstly, he must choose whether or not to stop in Puerto Calero. Race rules require a stop to be at least 12 hours, but it is also the last chance to make repairs on land before two weeks of open Atlantic Ocean crossing. Secondly, he must decide whether to steer to the south of Canary Islands in the hopes of reaching the trade winds sooner, or whether to take the shorter and more direct route through the islands. We will have to keep watching to see what he decides to do, and then watch some more to see how those decisions play out. The November 13th start of the 2013 Mini Transat (attempt #2) was said to be a beautiful one. The sun was shining and the waters in the bay in Sada, Spain were calm. In the following hours, as the fleet headed to Cape Finisterre, however, the winds built to 40+ knots and the waves mounted. The strong winds have persisted: at 3700 NM this will be the longest Mini Transat leg ever and, with the forecasted 30+ knot winds, possibly one of the fastest as well. Two days into the race and 587 Naked Retreats is among the top 10 boats. They are leaving Europe behind, heading for a mark in the Canary Islands before bearing west to Pointe-a-Pitre, Guadeloupe. The map (ï¿½cartographieï¿½) is updated at 11 pm, 3 am, 7 am, and 11 am PST. Craig is back in Europe following the latest twist in what has to be one of the most unpredictable of Transat races. The first leg of the 2013 Mini Transat was officially abandoned after a big storm in the Bay of Biscay came in sooner than expected, causing the race organizers to direct the boats to seek shelter in whichever port they safely could. The majority of the boats went to Gijon while the lead boats made it to Sada on the Spanish coast. A new start date was tentatively set for Nov 7th and, because the first leg no longer counted, Craig would be allowed to rejoin the fleet if he wanted to. And he wanted to, but didnï¿½t see how he could make all of the necessary repairs and tow the boat to Spain in time. So instead he flew home to Seattle. The race plans have once again changed, however: a new start on Nov 12th from Sada, Spain direct to Guadeloupe means that Craig might be able to make the necessary repairs and still be at the start line. It is a crazy plan for what has been a crazy race but there is a chance that it will work and so he is going for it. 587 Naked Retreats has had to retire from the 2013 Mini Transat. A collision at the start resulted in too much damage to repair in the 12 hour window that the weather allowed for restarts. We would like to thank everyone for their support up to this point and look forward to the next challenges. The 2013 Mini Transat will start on Tuesday, Oct 29 at 9 AM (French time). 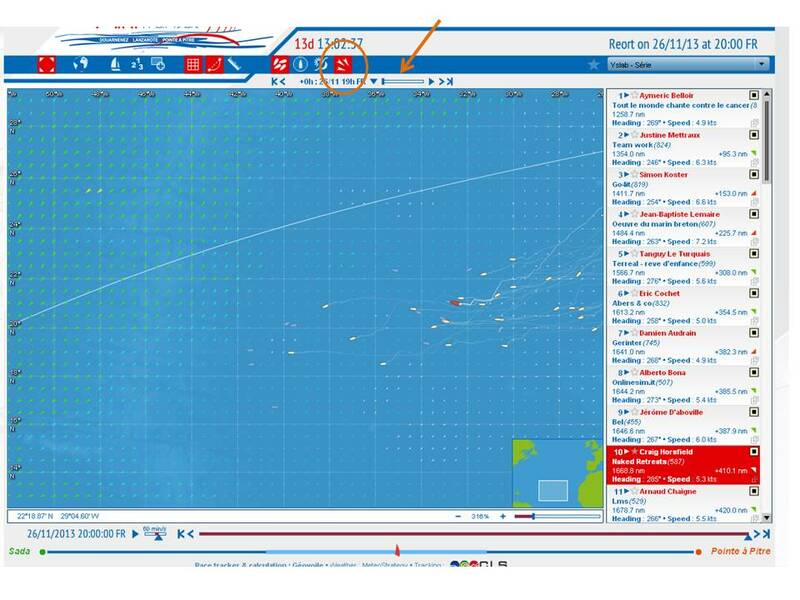 You can follow the race directly at the Mini Transat site by clicking on "Cartographie". They promise to update the positions every 10 minutes for the first 10 miles of the race. and you can watch the boats pass through the Raz de Sein on the Pointe du Raz webcam. A "code green" has been declared, which means that a start is possible in the next 24 hours. Currently the most likely scenario is for the 84 boats to start on the morning of Tuesday, Oct 29 with a course set directly for Lanzarote. It should be a fast start to the race, with strong winds from the northwest. By Nov 1st, however, the strong southwesterlies should return resulting in a tough upwind race through high seas. 1. A Friday afternoon start with a stopover in Gijon, Spain. The race would then restart for Lanzarote on Tuesday, Oct 29. 2. A start directly for Lanzarote on Monday, Oct 28. We should know on Thursday. Until then, we keep waiting. It was unseasonably sunny in Douarnenez in Brittany, France. We basked in the sunshine as the 2013 Transat race village bustled and the docks overflowed with sails, water, fuel, and preparations. But despite the unseasonal sunshine in Douarnenez, a massive depression set in over the Bay of Biscay making it too dangerous to send the 84 boats out across it to Cape Finisterre. The October 13 start turned into a ï¿½parade of boatsï¿½ ending with all the skippers back at the docks. The race village has been dismantled, the rain has set in, and everyone is waiting for a window in the weather to open up. A potential plan to start on Wednesday Oct 16 and sail as far as Gijon, Spain has been abandoned; we are now told that nothing will happen before Wednesday Oct 23rd. In the meantime, we ï¿½ skippers and spectators alike - will just keep waiting. Naked Retreats rounded Fastnet Rock in the early morning hours, then opened sails for the downwind leg back to Douarnenez. It was a wild ride back: Craig reported top speeds of 22 knots. They completed the course on Friday at 21h40, finishing 18th among the series boats. Craig and Andy on #587 Naked Retreats were among the first five series boats to pass between Wolf Rock and Land's End. In the Irish Sea, however, it seems as if the wind died and any leads in the series boat race diminished. With 380 NM to the finish line, Naked Retreats is in 12th place. With the Demi-Cle and Pornichet Select completed, #587 and I are qualified for the 2013 Transat. In a few weeks, I will be headed back to France for the MAP and Fastnet. 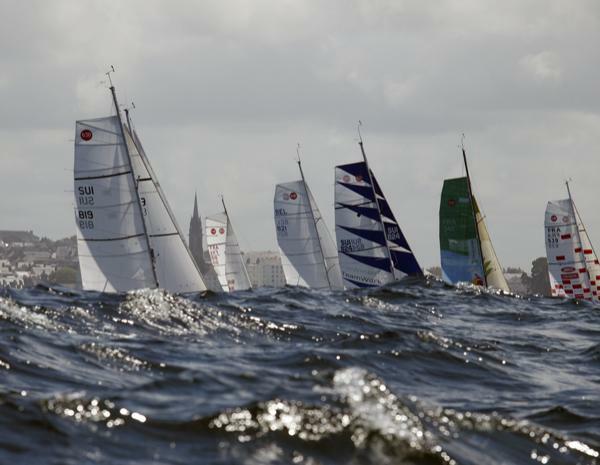 These are both challenging races in an area with strong tides and many navigational hazards. The MAP is a single-handed, inshore race much like the Select and will pose challenges from sleep management to inshore navigation. The course starts in Douarnenez and heads south through the Raz de Sein, around Isle de Groix, and back to Douarnenez via the Sein. The Fastnet will take us to Fastnet Rock (600 NM round trip) and is one of the most challenging races of the season. Often the race sails a different course due to bad weather: this will be my fourth attempt and I have yet to sail the course around Fastnet. The boat has made it through the season so far without a lot of damage but in the Select the autopilot, which is quite critical, malfunctioned and now has to be repaired. The new part will be installed just before the MAP and we will be out on the water calibrating and ensuring the system is working in the days before the start of the race. The Pornichet Select is one of the more challenging mini races with a high attrition rate. This year turned out to be, as this race goes, fairly easy since the weather was relatively good and it wasnï¿½t as cold as it often is. Craig has finished the Pornichet Select, the 7th Series boat to cross the finish line. After rounding Ile de Groix, he was in 3rd place but a broken autopilot meant that he steered the boat for most of the 2 days, 16 hours, and 56 min that it took him to complete the course. By the time he entered the bay at Pornichet, he was too tired to keep a few boats from passing him. More to follow after he gets some sleep. Demi-Cle completed. Next Up: the Pornichet Select. The Demi-Cle was delayed by a day but it was probably a wise decision: it would have been insane to head out into 30 - 40 knots with 5+m waves. 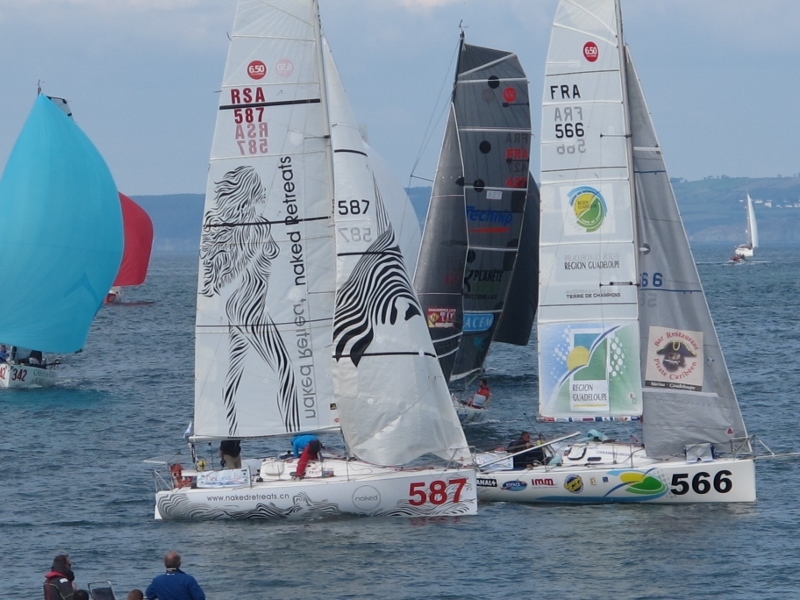 By Sundayï¿½s start, the wind was dropping to 16 knots and going more west. I managed a front row start near the committee boat but about 2 minutes later the jib sheet blew off the winch. The 16 miles upwind to Birvideaux light was my weakest leg: I struggled to keep the mini moving well in the big swell and chop. Over time, the feeling of driving a mini started to come back and I began to hold on to the boats ahead. 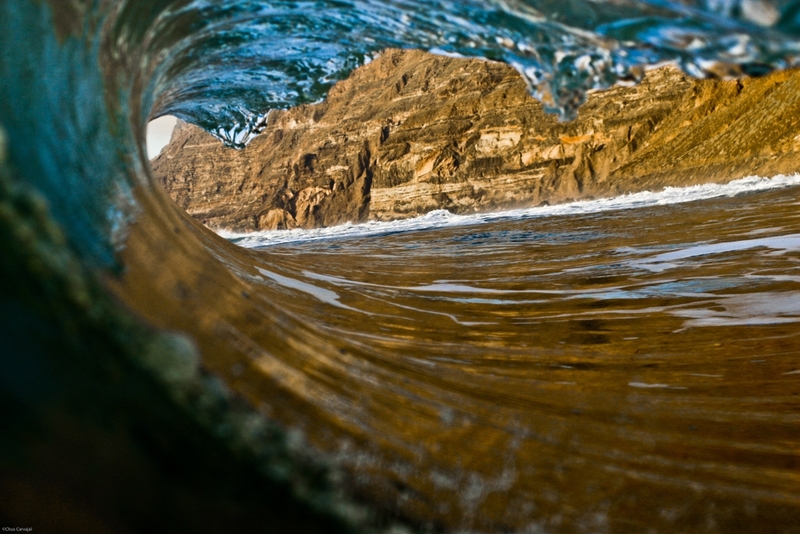 At the light, the swell was big with large, breaking waves around it. To put it in perspective: we were reaching along with another mini, which has an 11 m mast, 100 feet to the side of us and in every swell we lost sight of it. I stood off an extra half mile, above what I thought was safe. Sure enough, other sailors cut in much closer and passed us, although we later passed the same boats again. To save distance and to get a better angle, we cut inside the islands east of Belle Ile. The entrance is tricky: very narrow with a lot of rocks. We came in with the code 0 doing about 8 knots. Not much time to fix any navigation errors. We made it to Pornichet at about 9 pm. Nothing broke and we had a good test of the new rigging and code 0. We didnï¿½t finish especially well, but considering that we were still putting the boat together 24 hours before the start and were stuck in port with no time for a practice sail, I am happy enough. Top speed: 13 knots with medium spi and full main in 20 knots of breeze. Time to go faster in the next race. I need to make some adjustments to the rig now and practice all week before the major race of this trip, the Pornichet Select, starts on Saturday. For this race, I will be solo. It is one of the hardest races: long, close inshore with lots of traffic. In 2009, this race almost made me give up minis. This time, I know what I am getting into. The first mini 6.50 race in the Atlantic is fast approaching. 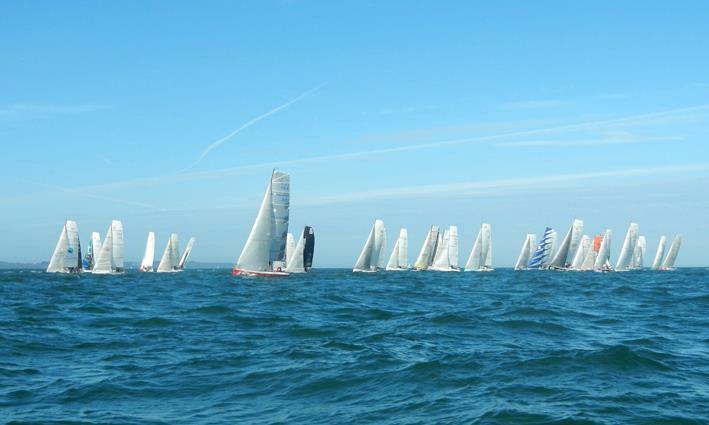 On the 10th of April, #587 will be starting in the Demi Cle, a 150 NM double-handed race from Locmiquï¿½lic to Pornichet. And I am excited to be back in a Mini 6,50 again. This time, I will be sailing a Pogo2, #587. To qualify for the 2013 Mini Transat from Douarnenez, France to Pointe a Pitre, Guadeloupe, I will need another 350 NM, of which one race must be single-handed. I have entered the Atlantic races, starting with the Demi-Cle in April, followed by the Pornichet Select. I am looking forward to being on the water again. This sailing season will, I am sure, bring its joys and challenges.